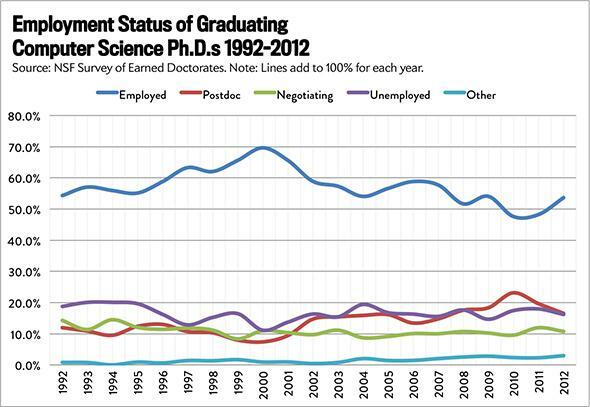 Employment rates for STEM Ph.D.s: It’s a stagnant job market for young scientists. Employment rates for STEM Ph.D.s are down or stagnant across the board. The overall demand for new Ph.D.s in the fields of science, technology, engineering, and math is stagnant. Young scientists spend most of their work lives gathering and crunching data. So it seems especially unfair that when it comes to the job hunt, they’re forced to fly mostly blind. 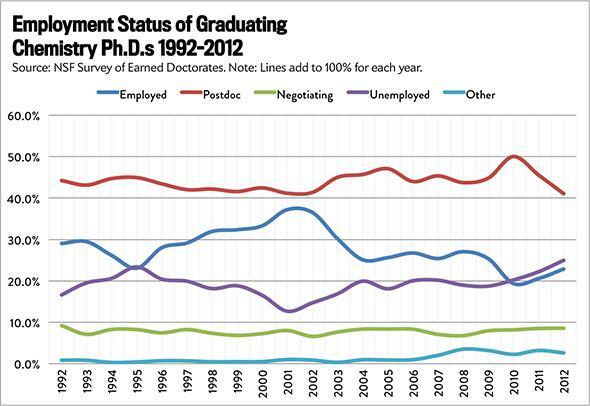 Ph.D. programs don’t usually track their graduates’ employment outcomes. They certainly don’t advertise placement figures the way that, say, business schools do. While the government collects troves of information from America’s doctorate holders every year, much of it is weirdly organized and tricky to access. With a little cleaning up, however, the federal data do tell a pretty clear story: The market for new Ph.D.s in the much obsessed-about STEM fields—science, technology, engineering, and math—is stagnant. Over the last 20 years, employment rates are either flat or down in each major discipline, from computer science to chemistry. It’s not what you’d expect given the way companies like Microsoft talk about talent shortages. Who have other plans, such as pursuing yet another degree. But before we start looking at charts, a bit of context. You can spend dozens and dozens of pages discussing the employment prospects for each of these individual fields (and trust me, people have). And it’s important to remember that these numbers only represent a snapshot of Ph.D.s during their graduation year; in time, the vast majority of grads find some kind of work or research appointment. 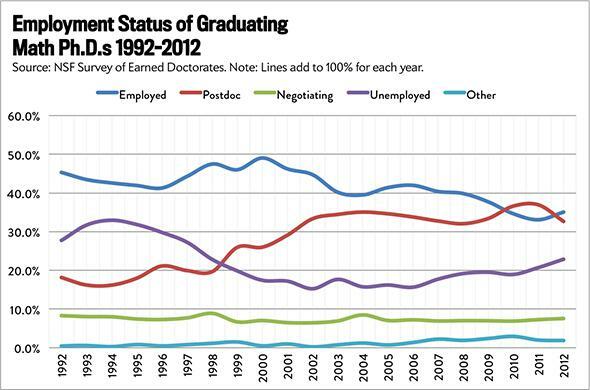 Unemployment among doctorate holders, even young ones, is extremely low, usually around 2 percent. But it’s worth examining these trends, because they can tell us more about the overall direction of the labor market. First, we know what an actual boom looks like in these fields, thanks to the way employment rates spiked during the glory days of the late 1990s. We are very, very far from that peak. Second, in almost every discipline, the number of postdocs (or young Ph.D. holders working under the tutelage of an established scientist) has either been rising or stayed incredibly high, which is not an especially positive sign for the job market. Postdoc appointments are temporary, usually lasting a couple of years. Some involve independent research and ideally give young scientists a chance to publish articles that will help them land a tenure-track job; some are little more than lab assistant positions. But the pay, as shown in this graph from the NSF, is almost always low, especially for somebody who just spent six years or more earning a degree. Considering that it’s not uncommon in some fields to spend four years or more stringing postdocs together, this period of additional training means that many Ph.D.s will be well into their 30s before they have a permanent job with a salary that reflects their education. With that, let’s have some more pictures! (For the deeply interested: You can click on the graphs below to download their data.) First up, we’ll look at the life sciences. By far the largest category—it encompasses biomedical and health sciences, along with agriculture and natural resources—it’s also treated as the poster child for economic dysfunction in the scientific community. 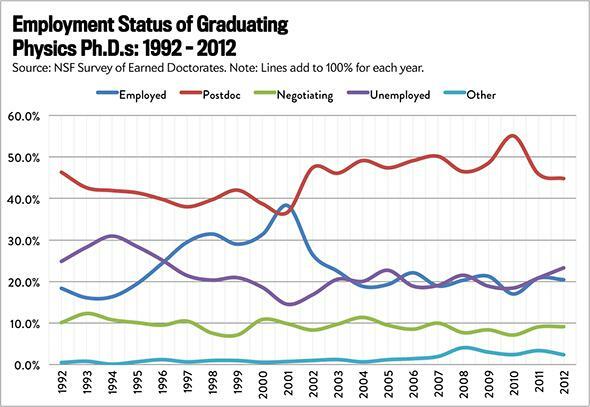 Note the red line hovering above 40 percent employment: Those are the postdocs. Meanwhile, even through the late-’90s boom and late-’00s bust, employment rates (in blue) have remained generally mediocre. Particularly telling is the “other” line in teal: A rising share of these students may be looking for degrees in other fields. Physics has seen a slightly different pattern. Employment leaped in the dot-com era, then plummeted. But current graduates may be in a better position than they would have been in the early 1990s, since postdoc status seems to have replaced unemployment. 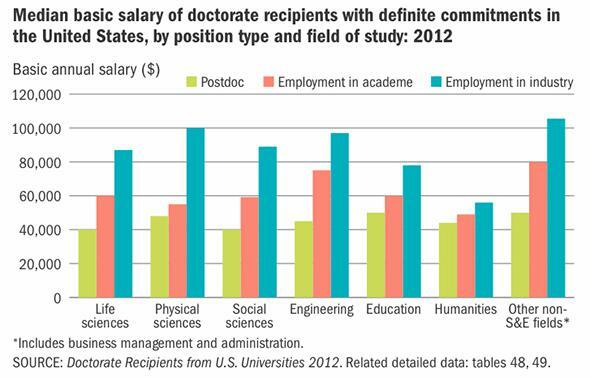 High levels of postdocs aren’t ideal, but they’re far better than nothing. For mathematicians, both employment and unemployment have dropped over time, as postdoc appointments have increased. If there were a shortage of any type of Ph.D., you would expect it to be computer scientists, given the gusher of money pouring out of Silicon Valley. However, employment rates are still well below their turn-of-the-century peak. Meanwhile, computer science postdocs have risen by 10 percent. Engineering, another high-demand field, has also seen a gradual decline in employment rates and a rise of postdoc appointments. 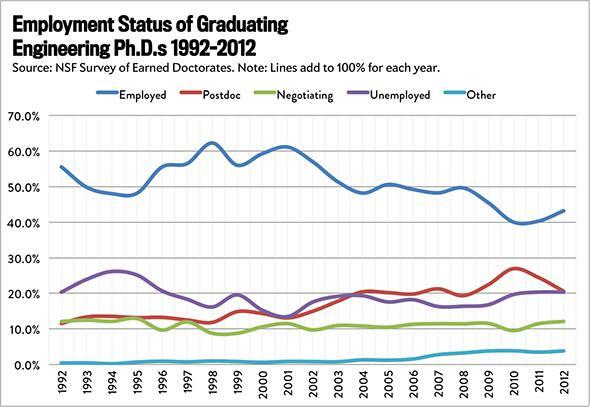 Why is employment declining, and why are postdocs rising? The reasons are different in every field. One of the problems with the entire concept of STEM is that the acronym combines several distinct disciplines with different job markets, and encourages politicians and journalists to talk about them as if they were one and the same. That said, there are some common underlying themes. Most important of all, perhaps, is that Ph.D. production isn’t tied in any meaningful way to the long-term job market. Instead, as Michael Teitelbaum explains in Falling Behind? : Boom, Bust and the Global Race for Scientific Talent, universities tend to admit students and hire postdocs based on the amount of research funding that’s available. Moreover, there’s a nearly inexhaustible supply of international students, who are often happy to work for low postdoc wages if it means staying in the United States after graduation. In some senses, that’s wonderful—we want talented immigrants in this country, and we want universities to conduct research affordably. But it means enrollment is less likely to drop when the U.S. labor market gets soft. While universities are bringing more Ph.D. students and postdocs onto campus, they aren’t hiring many more full-time professors. Thus, you get this stunning graph, published in Nature Biotechnology. 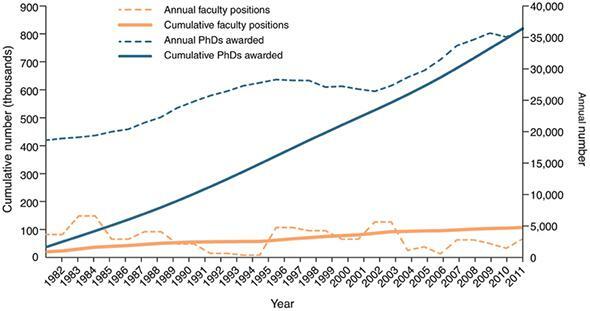 The dotted blue line is the annual number of Ph.D.s awarded in the sciences and engineering (right axis), while the dotted yellow line is the annual number of new faculty positions. Again, the most extreme example of this pattern may be the biomedical sciences. When the National Institutes of Health budget doubled between 1998 and 2003, it led to a flood of research money for established professors, who hired on postdocs and brought on students to accommodate the new work. Since universities didn’t correspondingly boost their faculty hiring, there wasn’t really anywhere for them to go afterward. However, we’ve seen versions of the story in other fields. Anita Jones, a computer science professor at the University of Virginia who has studied the growth of postdocs in her field, chalked the phenomenon up to problems in the academy. “Because there was a substantial retraction of state funding for the state/public universities, the number of faculty went down, and in some schools, the number of graduate students decreased,” she wrote to me in an email. “Yet research funding was stable or increasing. Who could do the work? How could that loss of research talent in the CS laboratory be replaced? Postdocs were part of the answer.” And of course, computer science Ph.D.s are lucky, because once they decide to leave academia, they’ll have plenty of opportunities in the private sector. Ultimately, the private sector does a good job of absorbing most of the extra science talent that our universities produce. 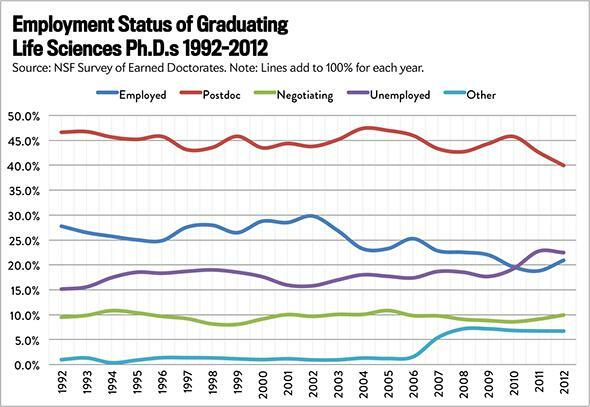 (Again, the unemployment rate among Ph.D.s is enviably low.) But unlike the computer geniuses, many doctorate holders end up working a bit outside of their fields. Among biomedical science grads, only 59 percent landed in a job “closely related” to their fields of study, down from more than 70 percent in 1997. Among chemists, the percentage was 52 percent, down from 55 percent a decade earlier. Is this a tragedy? No, especially because Ph.D. holders, in the long term, tend to make good salaries and leave school with low graduate student debt. (Unlike their counterparts in the humanities, their studies are well-funded by all those research grants.) But it’s a sign that all is not exceptionally well in the job market for many scientists. Right now, the system asks students to sign up for around a decade of study and low-paid apprentice work to prepare for research careers that may not be there in the end. Update, July 16, 2014: This article was updated so that readers can now click the graphs to download the graphs’ data.